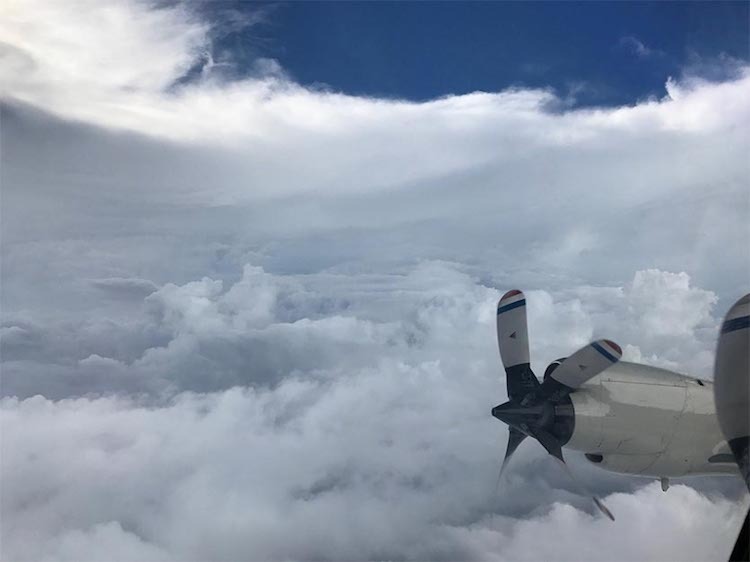 Rare pic taken Inside the eye of Irma on NOAA’s hurricane hunter aircraft September 5, 2017, when Irma was upgraded to a Category 5 storm. This is referred to as the "stadium effect". Image credit: CDR Kibbey/NOAA. 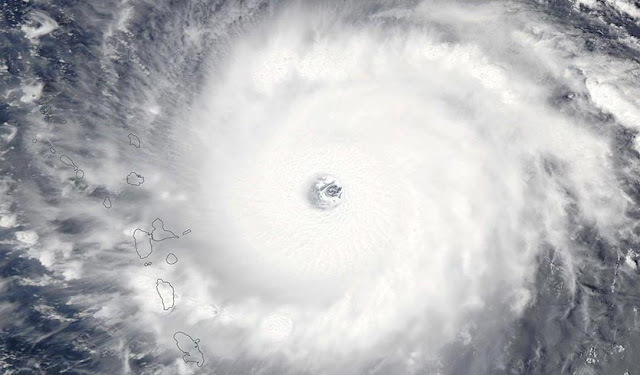 MODIS image of Hurricane Irma taken on Tuesday afternoon (Local Time), September 5, 2017. At the time, Irma was a Category 5 storm with 185 mph winds. Image credit: NASA. At 8 pm EDT, Irma was centered about 85 miles east of Antigua, moving just north of due west at about 15 mph. On its current track, Irma’s center will pass near or just between Antigua and Barbuda during the predawn hours Wednesday, and one or both islands could wind up in the extreme winds of Irma’s eyewall. Later Wednesday morning, Irma will be approaching St. Kitts and Nevis, Anguilla, and St. Barthelemy, and by Wednesday afternoon Irma’s core will likely be nearing the British Virgin Islands. Irma is in the midst of a very subtle turn toward the west-northwest, which may take its center just north of the U.S. Virgin Islands and Puerto Rico. Hurricane Irma is one of the most powerful Atlantic hurricanes ever: Wind speed 290 kmph ! As Irma moves closer to the United States, newly-formed Tropical Storm Jose will churn across the central Atlantic while another tropical system brews in the southwestern Gulf of Mexico this week. Moisture content still high over Delhi-NCR. 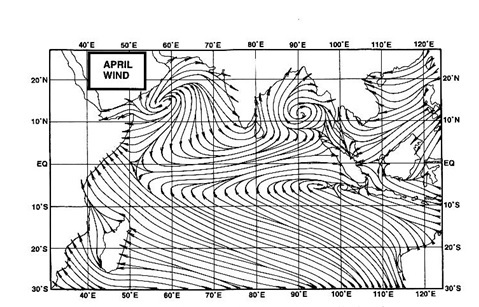 Gusty, dry and cool NW winds yet to start prevailing over NW India. What are your thoughts Rajesh Sir? Looks like Irma is a super cyclone as per Indian Ocean terminology... A super active typhoon season in absence of El Nino and a ENSO neutral status. Thankfully this worked well for SWM India. Hope for a grand finale for SWM 2017 in India before departure. Actual CRF till 06.09.2017 All over India 720.4 MM against Noraml (51-2000) 755.9 MM indictaing % cumulative departure of negative -4.7% till 06.09.2017. The sky in Mumbai looks like that the monsoon has departed from Mumbai but in fact the monsoon has not even departed from extreme west Rajasthan and Sindh. for the interested ones!!! the link mentions that SWM has covered up its deficit in South India and in excess & normal in more regions. Only Kerala and Coastal Kar is yet to come to normal which will happen before end of the season. I raised this issue as there have been constant talks about SWM not performing well in South India and verdict was given before end of season. Interesting blog, check it now. Another bullseye vagaries forecast, this time for Pune. Thundershowers currently in Pune. Hurricane Irma: Florida told to expect 15ft surges as storm closes in.